The Vancouver Condo Buzz » From $230’s! 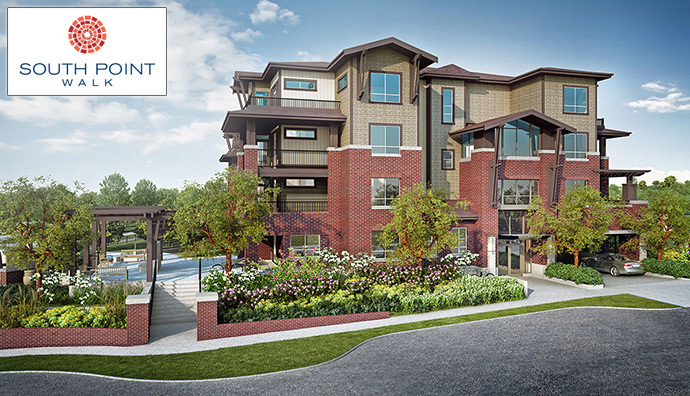 Affordable South Surrey Townhomes for Sale at SOUTH POINT WALK Townhouses by Streetside! MAKE A MOVE staring from just the $230’s! A collection of 42 homes located in the heart of the desirable South Surrey real estate district are coming soon to South Point Walk. 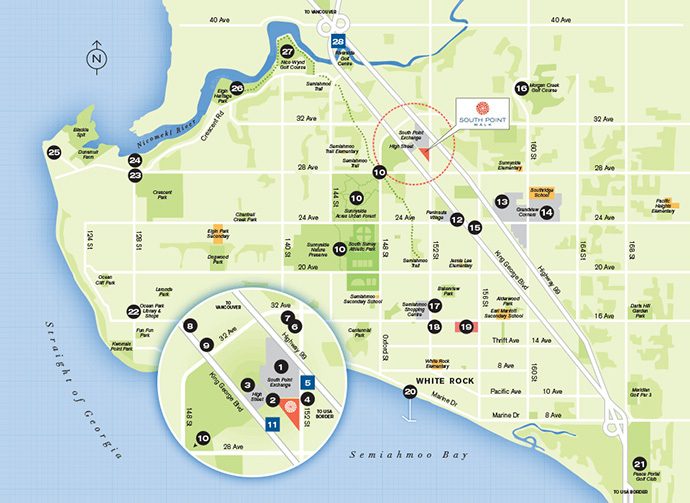 The South Surrey townhouses are close to shopping, transit routes, nature walks, South Point Exchange and the South Point Annex. The developer for the South Point Walk Surrey townhouses is StreetSide Developments, a part of Qualico group of companies, which is recognized as one of the largest and most experienced integrated real estate companies in all of Western Canada with over sixty years of experience. The homes at the new South Surrey South Point Walk development will feature a dedicated home office space or flex/work space, allowing you more room to grown, work and play in the same neighbourhood. In addition, some of the impressive indoor and outdoor community amenities here at South Point Walk Surrey townhouses include a fitness room, indoor amenity centre that has a clubhouse social lounge space with a kitchenette in addition to a trellised seating area with gas fireplace surrounding an outdoor BBQ area for residents. As well, there is a community garden with great sun exposure for home owners. The new South Surrey townhomes will be built with true West Coast Contemporary architecture that is designed by award winning Robert Ciccozzi Architecture. Some of the exterior features include long lasting asphalt shingle roofing, expansive low emission windows, rich exterior detailing, ground floor homes with individual patios and fenced yards with green space in addition to featured roofs with spacious balconies. All homes at the new South Point Walk Surrey townhome project will come with the comprehensive warranty protection by Travelers Guarantee Company of Canada. For more information, please visit www.southpointwalk.ca. These new South Surrey townhouses will present a very high-end finishing palette and contemporary features in each and every residence starting with the spacious interior living spaces. There will be two colour schemes for homebuyers that are designed and selected by Gannon Ross Designs. All homes will have two inch faux wood blinds and airy nine foot ceilings on the main floor. The bedrooms have loop and cut high quality carpets and the main living areas including the dining and kitchen spaces will have five or six inch plank laminate floors. There’s electric baseboard heating and individually controlled thermostats. The South Surrey South Point Walk townhomes will also feature Whirlpool stacked Energy Star rated front loading washer and dryer in every home. The spa baths will feature 12×24” ceramic tiled floors, under mount basin sinks, single lever polished chrome Grohe faucets and dual flush toilets. In addition, the ensuite or main bathrooms at the new South Point Walk South Surrey townhouses for sale will present solid granite or Quartz stone counters, contemporary flat panel cabinets with nickel pull hardware, hand set ceramic tiled tub or shower surrounds and Grohe rain showerhead along with luxurious Nu-Heat in floor radiant heating. The second bathrooms in select suites at the new South Point Walk Surrey townhomes will feature solid slab quartz counters, shaker style cabinets, deep soaker tub and wood trimmed vanity mirror. 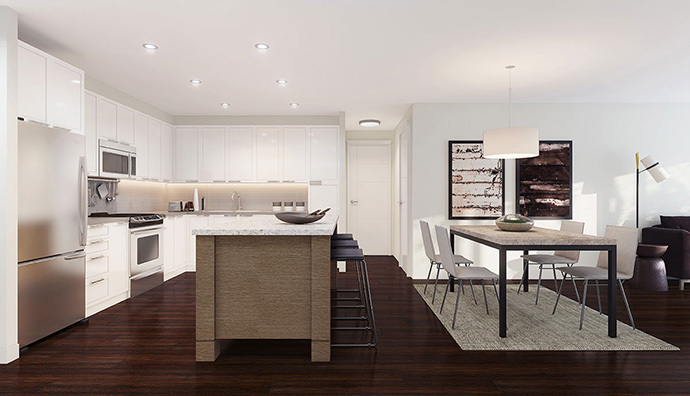 The kitchens at the new Surrey South Point Walk townhomes will feature classic shaker style cabinets and soft lose cabinetry doors. The counters will be quartzite (square edge) with full height ceramic tiled backsplashes. Other kitchen features include custom designed kitchen island with granite or quartz counters and square line profile cabinetry as well as custom backsplash accent with slab granite or marble mosaic tile. The gourmet appliance package will include a 30” Whirlpool gas slide-in stainless steel self cleaning range, Whirlpool microwave hood fan combo in stainless steel and a Whirlpool Energy Star rated French door fridge with bottom freezer (again in stainless steel). There’s also a Whirlpool stainless steel multi-cycle dishwasher, recessed pot lights and double bowl undermount stainless steel sink. A new collection of luxury apartments and South Surrey townhomes is coming soon to the South Point Walk project located at 152nd Street and 29A Ave Surrey. Brought to you by established builder, Streetside Developments, a Qualico company, the South Surrey townhome project is ideally located close to shopping, restaurants, schools, outdoor recreation and public transit. Also, the apartments will start from the $250,000’s. Centrally located near amazing shops and services in Morgan Crossing, the South Surrey South Point Walk townhouses is now underway and will feature an amazing array of apartment residences as well as multi-level townhomes for sale from $250’s. It’s brought to you by Streetside Developments, a Qualico Company.